Some might say that a squashed Corgi model of a TVR has inspired the creative mind behind the Canadian Felino CB7 supercar. Others would say that it is a brave new take on beauty. Whatever your thoughts, the appearance of the CB7 is bound to divide opinion among car enthusiasts around the world. What can't be argued with though, is that this machine is set to be ruddy fast. Although the top speed is yet to be announced - as the performance testing will not commence until this summer - the engine specs talk for themselves. The CB7 is fitted with a 525bhp, 6.2-litre V8 that drives power to the rear wheels, while the bodywork is fashioned mainly from carbon fibre. 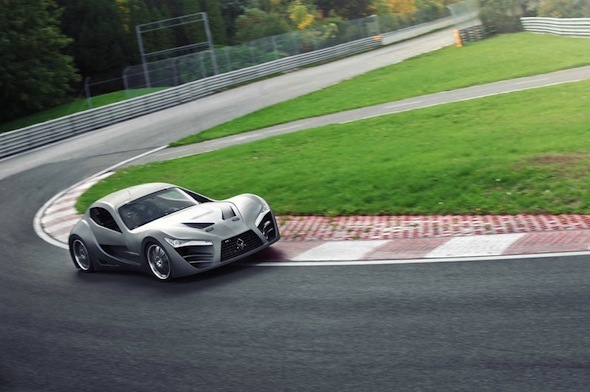 The total weight will be around 1100kg, so expect 200mph top speeds and eye-watering acceleration times. The man behind the CB7 is Canadian racing driver and general automotive enthusiast Antoine Bessette, so it should come as no surprise that the driving experience was very top of his list of priorities when sculpting his dream vehicle. Ugly or not, the CB7 has already gathered support from other motor sport personalities such as Canadian racing drivers Jacques Duval and Claude Bourbonnais. Mr Bourbonnais said: "I think that his concept will attract the attention of many race car fans and design enthusiasts as well." The car is still in its pre-production stage but when it does come on sale, it is planned to have an entry price of under $100,000 (around £60,200).